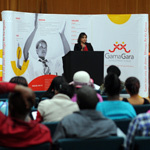 Gamagara Development Forum (GDF) hosted the Annual General Meeting (AGM) for the year ended 31 December 2012 on 16 October 2013 at Sesheng Hall. The event was attended by guest which included the board members of GDF, Mr Baldwin Matsimela, Stakeholder Relations and Communications Manager, Mr Reuben Matlala Project Director, Ms Natasha Camhee, Company Secretary from SIOC-cdt. Among the guests were auditors from Price Waterhouse Coopers Inc. (PWC) inclusive of the Director Mr Kevan Moodley who announced that GDF received a clean audit for the year under review. The beneficiary communities from Kathu, Sishen/Mapoteng, Deben, Olifantshoek and Dingleton were present. Mr Tebogo Bodumele the Chairperson of the board started by welcoming everyone present before proceeding with his chairperson’s report. Mr Bodumele stated that the World and South Africa in particular is facing challenges on youth unemployment amongst other challenges faced and he said that GDF has positioned itself as a champion for finding solutions for this seeming challenging problem and he said that GDF realises that the best results can only be achieved through team efforts involving all relevant stakeholders. He said that the focus should be on the GDF strategy positions which seek to address challenges that are facing our communities within the following focus areas: Welfare & Humanitarian; Healthcare; Land and Housing; Education and Development; Conservation and Welfare; Enterprise Development; Infrastructure; and Sports, Arts and Culture, that are in line with the National Development Plan and the 12 National Development Goals. Mr Bodumele welcomed the new Board Members, namely Ms Kehilwe Sedilang, Mr Jacob Zwartz, Mr Frank Visagie and Mr Motlogelwa Matsipane. He concluded by commending the Board and all stakeholders for a successful Annual General Meeting (held on 29 January 2013) at which, once more an unqualified, audited Financial Report was tabled. He said “We should all realise that we have set a standard for ourselves that we cannot afford to let go in future. I would further like to thank our Management under the leadership of the CEO, Mr Lepulane Maboshego for the sterling work they are doing”. He highlighted the achievements GDF for the year under review which includes the clean audit on financial statements, improved project management systems and execution, co-funding on projects with like- minded organisation, streamlined enterprise funding Anglo Zimele and support SMMEs Facility rental. Mr Motlogelwa Matsipane did the vote of thanks and he thanked all for their support and commitment by ensuring that the GDF slogan “Saam Kan ons dit doen. Mmogo Re Ka Kgona” is always taken into consideration. He concluded by saying that all of us need to ensure that we play our part by improving our lives and everybody should see the benefits of the company. Ms Camhee the program director for the AGM thanked all for attending and congratulated GDF for being committed, their guidance and leadership. She thanked the beneficiary communities for allowing the “Super Trust” to come to them for upliftment.